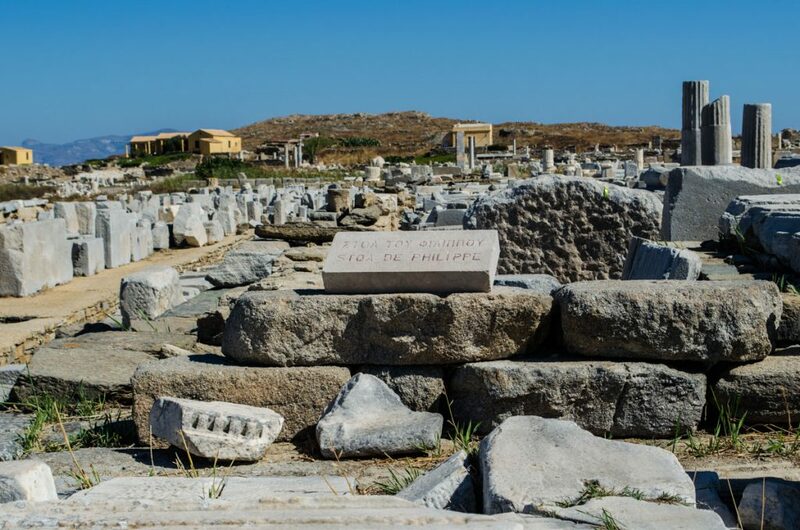 One of the top things our guests love to do is take a day trip to Delos. Here’s a look at what to see on this fascinating little island just 10 kilometers southwest of Mykonos. Delos is rocky barren island. There are no villages. No shops. There are no restaurants. However, a trip to Delos is one of the best things to do on Mykonos. Why? 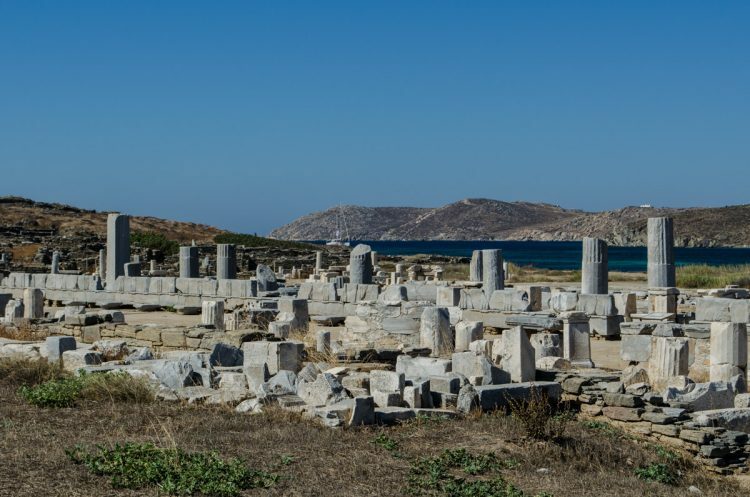 Delos is one of the most mystical archaeological sites to explore in the entire country. 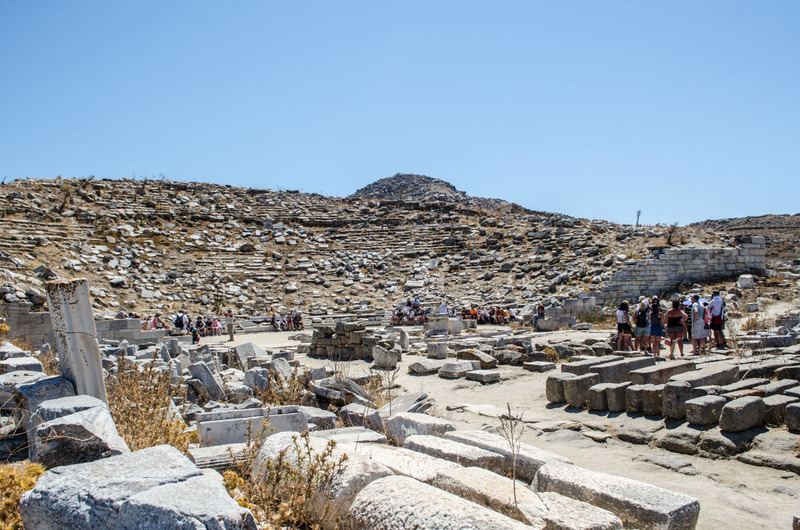 A short 30-minute boat ride from Mykonos will get you to Delos. Once you step on the land, you’ll find yourself on an island that has been inhabited since 3,000 B.C. 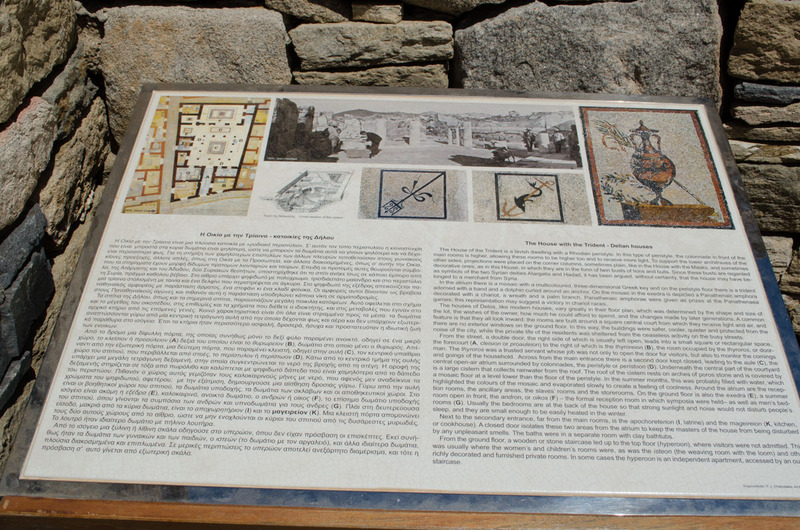 However, its glory days were between 1580-1200 B.C., the Mycenaean period. Here’s what you will want to check out at this UNESCO World Heritage Site. 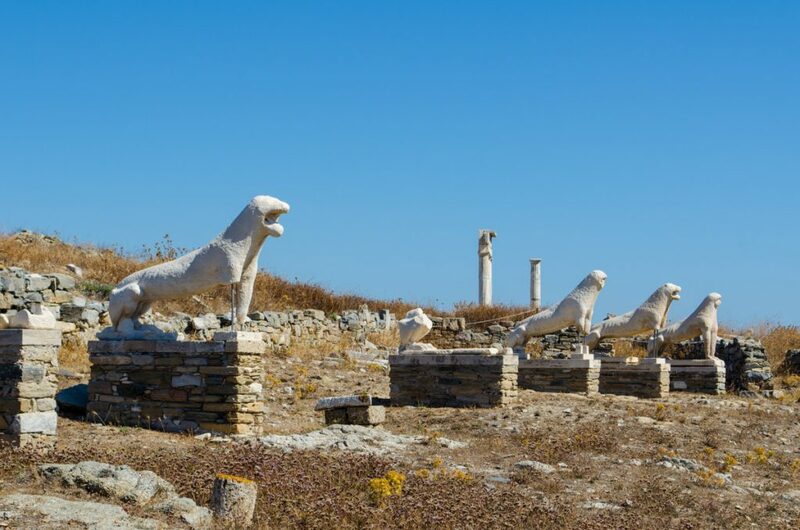 Most photo spreads about Delos show the beautiful Avenue of the Lions which is a row of splendid white marble lions. Only five remain of the original nine. 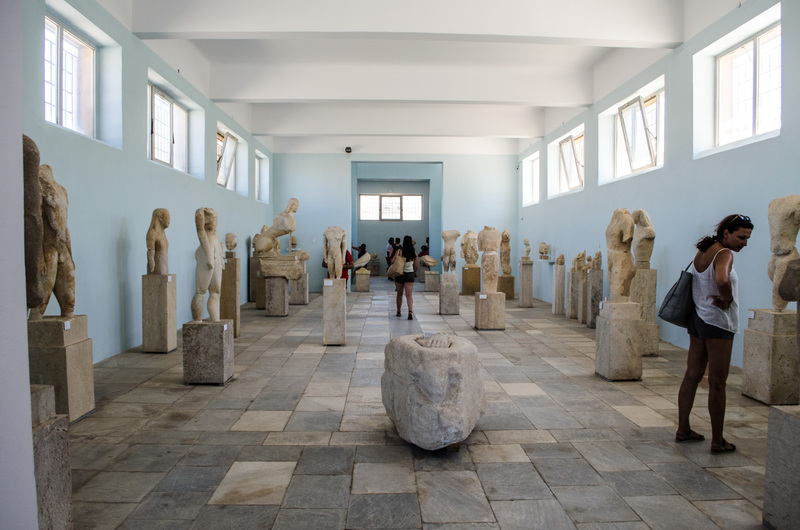 What you’ll see are replicas because the originals are housed safely in the Archaeological Museum of Delos. One lion was taken to Venice in the 17th century and it now overlooks the Arsenal there. These sculpted lions were a gift to the Greek god Apollo from the neighboring Cycladic island of Naxos. This museum is worth exploring. There are rooms of ancient art, fantastic mosaics, marble sculptures of Greek gods and decorative items from throughout history. This restored Doric style temple was built in the 2nd century B.C and it was dedicated to Isis, a goddess who represented the ideal mother. Isis was worshipped by both Greeks and Romans. The temple sits on a hill offering a sweeping view of the region. Centered between the commercial harbor and Mt. Kynthos is the Theatre Quarter where you’ll see what were once narrow paved streets. The House of Trident is an impressive sight. 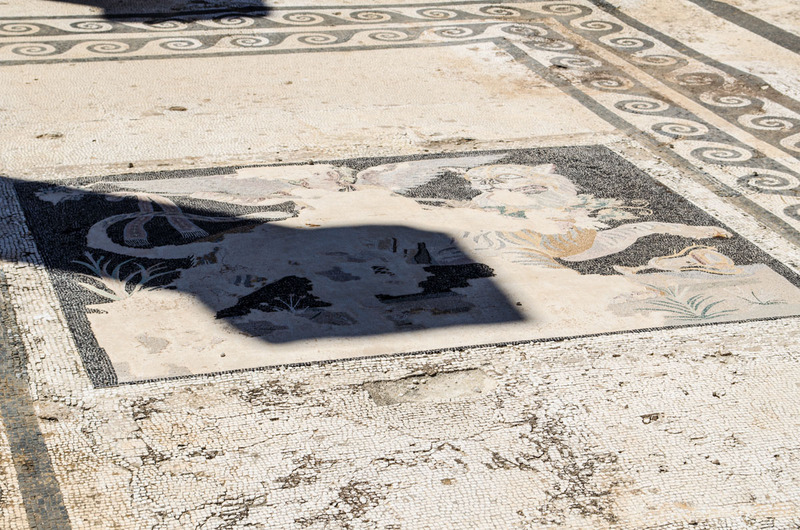 You’ll know this villa when you see a floor mosaic showing a dolphin. The Theatre Quarter is also home to an amphitheater that once seated more than 5,000 guests. The House of Dionysus is another private villa with a fantastic, marble columned yard surrounding a beautiful mosaic floor showing the Greek god Dionysus riding a tiger. At 113 meters high, Mt. Kynthos is worth a hike for those seeking a great panoramic shot over the archaeological site. From here, you can see the neighboring islands of Naxos, Syros, Tínos as well as Mykonos to the east. Would you like to visit Delos during your trip to Mykonos?